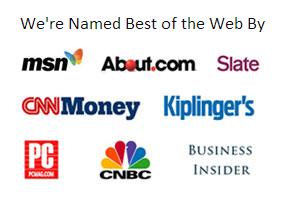 Wise Bread is an independent, award-winning, advertising-supported website. Many credit card offers that appear here are from companies from which Wise Bread receives compensation. This compensation may impact how and where products appear on this site (including, for example, the order in which they appear). Wise Bread does not include all card offers in the marketplace. On Friday, September 24th, my family was on the NBC Nightly News talking about changes we've made in the way we use credit cards because of the financial crisis. We'd interviewed with one of their L.A. reporters, Kristen Walker, a couple of weeks previous. Filming was a blast. We were a little nervous, not knowing what they'd ask or, after the interview, what clips they'd use. While both my husband and I felt like we said some more intelligent, compelling things than were in the clips they actually used, overall the process was a blast. And shopping at Target with the camera guy was a trip, too! The topic was a timely one for us. My husband, a college professor, lost his job on July 1, 2010, because the college he worked for didn't have the incoming tuition to renew his contract. We knew it was coming and have cut back on our credit card use since early this year. While we've always been responsible with our cards, we wanted to be sure that we could pay the bill each month. We've also found that it's easier to limit our spending when we use cash or debit cards instead of credit cards. When you actually have to hand over bills or when you know that the bottom line in your checking account will take a direct hit, you're less likely to spend money on things you don't need. The Best Kept Secret to Frugal Living — Find out how to think differently in order to spend less. Turns out, spending is all about your motivations and your mindset. 5 Steps Toward Financial Independence — Credit card debt is often a problem for young people who don't know any better. Avoid this and other debt traps, and you're well on your way to financial independence. Who Should Face the Music When the Banks Fail? — There's a lot of blame flying around during this financial crisis. Who do you think should be required to pay when things go this badly wrong? Walking the Tightrope of Financial Recovery — Do you need to get back on your feet because of credit card or other debt? Find some practical advice here. The Entrepreneurial Spirit and the Economic Crunch — Looking to start your own business even though the economic outlook is still bland? Hear from some people who've done it about the positives and the pitfalls. Breathing Easy on the Financial Rollercoaster — If you're struggling with money, stop and take a deep breath. Taking some time to reassess your situation will help you get out of it stronger and recover faster. Dealing With Financial Drought: A Recovery Plan — When things get tough, it's easy to panic. Instead of panicking, though, make a plan and stick to it. To FAFSA or Not to FAFSA — Looking at taking out student loans? Before you sign on to debt, here are some things to consider. Feeling Poor: Things I Forget About that Don't Cost a Thing — When hard economic times hit, it's easy to feel like nothing's going your way. Remembering the things that are can give you the perspective you need to get back on track. Should You Finance a Tiny Home With a Credit Card? Disclaimer: The responses below are not provided or commissioned by the bank advertiser. Responses have not been reviewed, approved or otherwise endorsed by the bank advertiser. It is not the bank advertiser's responsibility to ensure all posts and/or questions are answered. You were used to put a voice to the story, pretty well. I agree with Will though about Mirren (sp?). She totally stole the show! Chase Sapphire Preferred® Card - Favorite card of frequent travelers. Bonus offer worth $750 in travel through Ultimate Rewards Portal. Citi Double Cash Card - 18 month BT offer - Get 2% cash back: 1% when you buy, 1% when you pay. Reviews of cards offered by each bank. Advertiser Disclosure: Many of the credit card offers that appear on the website are from credit card companies from which Wise Bread receives compensation. This compensation may impact how and where products appear on this site (including, for example, the order in which they appear). This site does not include all credit card companies or all available credit card offers. Please view our advertiser disclosure page for more information.